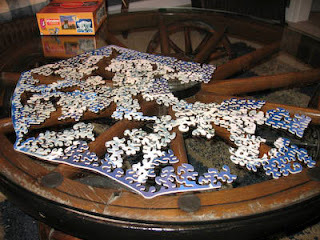 SAHM Ramblings: Results are in – Pieceless Jigsaw Puzzle! As I mentioned in my prior post, “A New Kind of Jigsaw Puzzle – Pieceless”, I requested a sample of Ceaco’s new pieceless jigsaw puzzle. While skeptical at the idea of how easy a puzzle would be if all pieces are connected, I also was completely intrigued. On Sunday, the girls and I jointly completed one of the many Princess puzzles in their inventory. In this case, a 100-piece puzzle. As is traditional, it remains “on display” on the table in my sitting room until I put it away or until we pick a new one to work on. I was on pins and needles when my Pieceless puzzle arrived in Monday’s mail. I waited for the girls to be busy with something else so I could examine it without their interference. I pushed the princess puzzle to the side and tore open the newest addition to my puzzle collection. What I did was lay it out, then connect the ends to form the edge. That left a huge tangled mess in the middle, which actually was kind of fun to undo. Putting the puzzle together became more like a craft project and less like a traditional puzzle. I enjoy the hunt for that one particular piece – over and over. For anyone who has ever done a puzzle with me, they know that to put the edge together first is completely taboo. I always look at the photo and pick what I’m going to work on, then work my way out to the edges and assemble them when their portion of the picture is ready. With the pieceless puzzle, I methodically put all the strands of puzzle into place until it was done. Interesting. So as I’m admiring it, I start to read the insert inside the box, as well as the directions on the outside. The instructions say “Flatten the puzzle and begin connecting the branches.” Oh. Okay, guess we’ll do it that way when the girls help on round two of testing. I decided to show the girls the new puzzle and get their take. I laid it out flat, per the instructions, when the doorbell rang. The local energy company is installing new meters, so I talked to the meter guy before returning back to the kids, who by now had turned into pre-nap gremlins. In that short amount of time that I was at the door, they decided to clear the princess puzzle off of the table. All of the pieces were now under the table. I let them finish the new pieceless puzzle, then sent them for their naps. When they were finally asleep, I reassembled the princess puzzle to make sure all pieces were present and accounted for. Of course, a hole remained in the middle where one lone piece belonged. I searched the floor, the furniture, the other room for no less than five minutes before finally locating that stupid piece. In hindsight, I believe that Ceaco must have put some kind of subliminal message inside their puzzle box to make sure that my kids helped illustrate another advantage of the pieceless puzzle. Pros/Cons for me: The puzzle we were working on is the mid-level puzzle for ages 8 and up. Assembly for me, like I said, wasn’t the same as a regular jigsaw puzzle. Granted, I was working on a children’s puzzle, so it’s an unfair conclusion until I test one a little more age appropriate. As I explained to DH, it does present that “once you start it, you have to finish it” feeling. I’ve racked my brain but haven’t been able to come up with the exact analogy. This is as close as I can get - my MIL has a throw-blanket that has tassels on the ends that constantly get tangled. While vacationing at her house one time, I remember sitting on the couch watching TV and working on ‘fixing’ all the tangles. She kept telling me it wasn’t important since she was planning on cutting the tassels off, but I insisted. Maybe I’m the only person in the world who would spend time trying to untangle a senseless knot. I’m anxious to try out the “12 and up” version of the puzzle to see if it lends itself more to the feel of a standard puzzle. Luckily, our local Farm & Fleet is having their annual Toy Sale this weekend and I already noticed the Pieceless Puzzles in the ad! Pros/Cons for the kids: Considering my girls are 4 and 3, I think they fared quite well with an “8 and up” puzzle. I definitely saw advantages for them. Aside from the aforementioned puzzle piece scavenger hunt advantage, I did find a few things noteworthy. First, this puzzle really put their fine motor skills to the test, not to mention their focus. Once they started working on a strand, they stuck with it until it was done, then moved on to others that had fallen into place along the way. 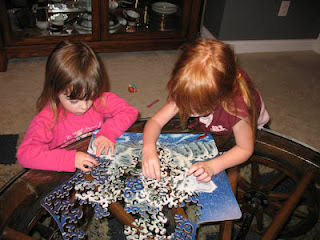 Because of the nature of how the puzzle is designed (you find where a strand goes, then work it until it’s completely in place), it forced the kids to stay in their own area of the puzzle. With a traditional puzzle, there’s always that “No, it’s MY piece” issue. I needed to help them a few times by saying things like “Can you find the part that’s this color and looks like a hand with fingers?” I also helped untangle pieces when they would overlap funny. – Things that were only an issue because of their age. For anyone who travels with kids, this would be great for killing that lull time in a hotel. The puzzle would pack easily and there’s no concern about losing pieces. It’s also double sided so it’s two puzzles in one. There’s also the option of working with a flat puzzle as the directions state or closing the edges off and working with the ‘tangled mess’ in the middle. The two puzzle strategies provide different working conditions and a different overall experience. My only concern is that since the puzzle is cut in a particular way, there is no “mixing up the pieces” to make it different from the time before. If you’re laying it flat, it’s more or less always going to be the same. I think it’s a unique twist on a classic idea and have already recommended it to my daughter’s preschool teacher, as well as my sister-in-law who teaches 3rd grade. I’m planning on picking up another one at Farm & Fleet this weekend!